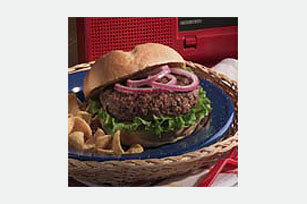 Tangy MIRACLE WHIP Dressing and GOOD SEASONS Zesty Italian Dressing Mix give these burgers their zesty appeal. Mix meat and dressing mix. Shape into 4 patties. Place patties on greased grill over medium coals. Grill 7 to 9 min. on each side or until cooked through (160°F). Spread cut sides of rolls evenly with dressing. Fill with patties, lettuce and onions. Serve with raw veggies and your favorite fresh fruit. Mix and shape patties as directed. Cook in skillet on medium-high heat 5 to 7 min. on each side or until cooked through (160°F). Continue as directed.